Santa Clara, California was the place to be last night as Super Bowl 50 took over Levi’s Stadium and the surrounding area. The Carolina Panthers weren’t able to conquer the Denver Broncos and lost 10-24. While there were many amazing plays throughout the game, here are a few non-athletic highlights and lowlights of Super Bowl 50. The pregame ceremony involved honoring past Super Bowl MVP’s, one of them being Patriot’s quarterback Tom Brady. While the other star players were recognized with cheers and applause, Brady was welcomed to boos from the crowd. After being accused of being aware of the intentional deflation of footballs that were used in the AFC Championship Game last year, he has lost much respect from fans and players. Lady Gaga began the Super Bowl with a powerful performance of the National Anthem. Dressed in a conservative outfit with her blonde locks flowing in the breeze, her voice rang out loud and clear for all to hear. It was an emotional and soulful flawless performance. 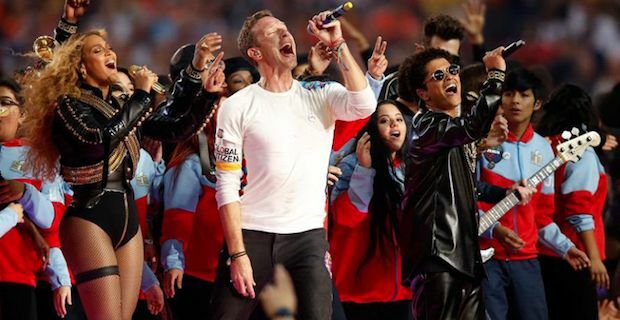 The Pepsi Super Bowl Halftime show is one of the main highlights of the match. This year it opened with Chris Martin singing “Viva La Vida” and “Paradise” with fans cheering. Once he handed it over to Bruno Mars the energy leveled quickly escalated during his performance of “Uptown Funk”. But the true highlight of the half time show was none other than Queen B herself. Beyonce belted out her newly released song “Formation” which was adrenaline pumping. Her and her dancers incorporated a black power salute in their demanding performance which gave social media much to talk about.